Height 5 feet 10½ inches. Weight 161 lbs. Chest measurement 35-39 inches. Complexion dark. Eyes brown. Hair dark. Sight normal - both eyes 6/6. Hearing and colour vision both normal. Limbs well formed. Full and perfect movement of all joints. Chest well formed. Heart and lungs normal. No illnesses. Free from hernia, varicocele, varisoce veins, haemorrhoids, inveterate or contagious skin disease. Good bodily and mental health. No slight defects. No fits. Fit. Motor Car Corner Cemetery, Comines-Warneton, Hainaut, Belgium. Sydenham Cemetery, Christchurch - memorial on parents' grave (damaged in earthquake, 2010). Percy Raymond Jones, born on 20 January 1889 at Timaru, was the younger son of Welsh-born Francis (Frank) Jones and Louisa née Middleton, who hailed from Yorkshire, England. Frank and Louisa must have lived in Timaru for a relatively short time, having previously been in Christchurch and afterwards in Napier. Perhaps they joined Frank’s siblings in Timaru – brother Thomas and sister Charlotte (Mrs Chapman). Percy registered for service in Christchurch on 20 January 1916, one of forty men who registered on a day of brisk recruiting. He had previously registered with the Reserves and he had military experience with E Battery, Christchurch. Percy was called up in 1917, but he had already enlisted on 1 June 1916, at which time he was a shipping customs clerk. Standing at 5 feet 10½ inches tall and weighing 161lbs, he was in good health and fit for service. His nominated next-of-kin was his father, of 139 Waltham Road, Sydenham, Christchurch, where Percy also lived prior to the war. A quota of 440 men for the 17th Reinforcements, comprising 425 in the infantry draft, 13 in artillery and 2 in signal service, was drafted in mid May 1916. Percy was selected for the artillery where there was a surplus of 15. The Christchurch and Timaru quotas went into camp on 1st June. This was the seventeenth time Christchurch city was to farewell drafts. Although the ceremony was by then well organised, there were still “mothers, fathers, sweethearts, ‘pals’ who talk so quickly, almost feverishly, to hide the ache that is there.” The men are the same in appearance as those who have gone before. Yet, “beneath the smile and jest can be detected an earnestness of purpose, a tenacity that will not only survive the months of strenuous endeavour of the training camp, the night watches, and oft-times hungers and thirst, but will increase to a doggedness of purpose that will send them over the hell swept parapet when the day of their trial comes.” On the evening of 31st May there had been a farewell in the King Edward Barracks. On departure day the Mayor, Mr H. Holland, remarked that some of them would serve under his son who held a commission in the artillery – probably Percy Jones. On behalf of the citizens he wished them good luck and God speed. Headed by the C.D.C. and C.Y.C. bands, the men marched to the special train at the station. Gunner Percy Raymond Jones embarked with the Field Artillery of the 17th Reinforcements on 23 September 1916 per the “Pakeha”, destined for Devonport, England. After almost two months at Sling he proceeded overseas on 13 January 1917, and the following month he was posted to the Divisional Ammunition Column. The next news came on 13 July 1917 in Casualty List 620. It was initially reported that Driver P. R. Jones, of the Artillery, was missing but very soon amended to “Killed in Action”. Indeed, he had been killed in action on 29 June 1917 in Belgium, aged 28 years. He was buried in Motor Car Corner Cemetery, Comines-Warneton, Hainaut, Belgium. Motor Car Corner marked the point beyond which cars were not allowed to proceed towards the front. The cemetery was begun in June 1917 at the outbreak of the Battle of Messines. 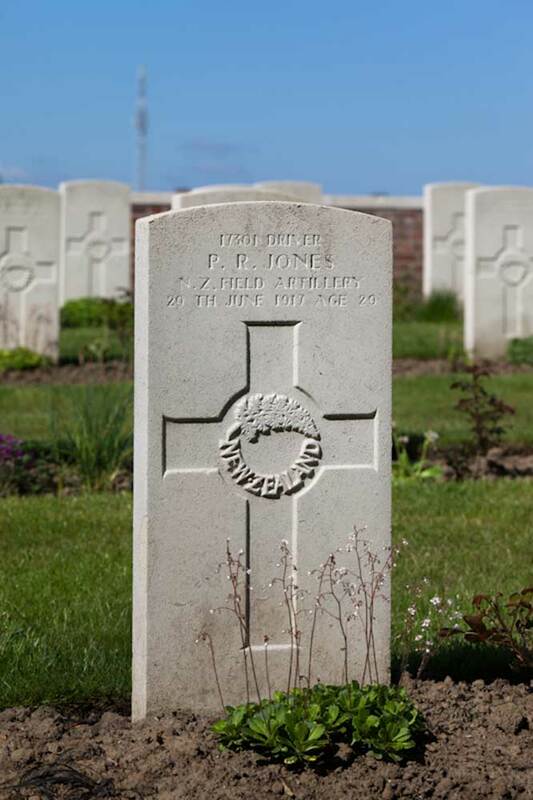 The Commonwealth War Graves Commission has his name recorded as Percival Raymond Jones. At Sydenham Cemetery, Christchurch, there is a memorial plaque on his parents' grave, the headstone being damaged in the 2010 earthquake and only the plaque in Percy’s honour surviving intact. Percy had played hockey in Christchurch. At the 1918 annual meeting of the Canterbury Hockey Association it was reported that the Addington Club had been forced to disband owing to members having left for the front. The committee paid a tribute to members who had sacrificed their lives in the nation’s cause. Among them were P. R. Jones and four fellow members of the Sydenham Club.